Muang Mai Market: Best Fruit Spot In The World? Muang Mai Market in Chiang Mai, Thailand may be the greatest fruit market in the world. I haven't been everywhere, of course, but I have spent the last six months meandering around Thailand, Laos, and Bali, places lauded for their fruit, and I've yet to encounter a location that bested Muang Mai Market's high-quality produce, vast selection, and rock-bottom prices. I like Chiang Mai for a lot of reasons: you can trip over fruit vendors walking down an average street, there's lots of classes and excursions to take part in, the vibe is laid back and happy, and there are plenty of interesting visitors and expats from all over the world to talk to. It even surprised me by having a good raw food restaurant. Yet if I could only pack up one part of this city and take it with me when I leave, Muang Mai Market would be my choice. Walk around its bustling streets long enough and you'll probably stumble upon a visiting raw foodist. Talking to many of them over the last few months, most have said Muang Mai is the best fruit market they've visited on their travels, although some have mentioned that Costa Rica's San Isidro Market, the Panama City farmer's market, Siem Reap's market in Cambodia, and Bukkitingi's produce markets on the Indonesian Island of Sumatera are all in the running. Regardless, I feel confident enough to say that Muang Mai is definitely at the top of the contender list. Muang Mai Market: What Is It? When I say fruit market, don't imagine a few stalls clustered together on some side street. Muang Mai Market is a huge, rambling collection of about a dozen large wholesale operations clustered in big buildings and probably more than 50 smaller vendors selling produce at or near wholesale prices from their carts, stores, and stalls. There are almost a dozen produce markets in Chiang Mai, but these are filled with resellers. Muang Mai is a wholesale market, where the city's restaurants, cart vendors, and the resellers that work at other markets come to pick up their produce. The produce prices are the lowest I've seen anywhere. Large 3 to 4 pound Papayas: 30 bhat each, or as low as 20 bhat for two to four very ripe/2nd grade papayas. Lady Finger, Cavendish, Burro, Golden, Egg (kluay-khai), "100 bunches" (roy wee), and Sandalwood" (jun), Bananas: 10 to 60 bhat per bunch or much cheaper when you buy them overripe. Most common varieties of bananas are cheap and ubiquitous. Durian: 90 Bhat for a medium-sized fruit. Nam Dok Mai Mangoes: Best mangoes I've ever tasted. You can buy low-grade ones beginning around 25 bhat per kilo, but it's worth paying 50 bhat per kilo for good quality fruit. Pineapples: 30 bhat for a medium-sized fruit. 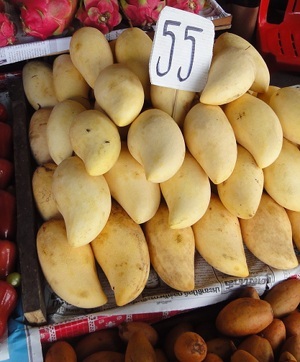 Jackfruit: These can be quite messy to open and take apart yourself, so I often buy them freshly precut from one of the vendors for aprox 40 bhat per kilo. Personal-sized 4 to 6 pound Watermelons: From 15 to 35 bhat, depending on quality. Tangerines: 40 to 80 bhat per kilo, depending on quality. Tomatoes: 30 to 50 bhat for a huge bag. I usually ride my bike over to Muang Mai Market every morning to stock up on fruit, and I usually find the experience enjoyable. Its bustling streets and alleys are crammed with motorbikes, bicycles, trucks, human-powered hand carts, and an endless supply of shoppers going about their daily tasks. The market is big enough that it took me more than a week just to visit every part of it, and much longer to find the best vendors. Although I speak very little Thai, many of the vendors speak some English and I've become friendly with a number of them. After visiting regularly for several months they've come to think of me as a friendly but oddly fruit-obsessed farang (they seem to have no concept of a raw food diet), and always assume I'm a fruit seller because I buy so much. I enjoy browsing around the stalls and looking at the fruit. If you look around you can spot when some of the rarer fruits appear in small numbers, often inhabiting some bin at the back of a stall. Sometimes the vendors tell me if they get something unusual because they know I'm on the look out for unique fruits. One downside is the smell in some areas. Muang Mai has several "streets of flesh," as I like to call them, bloody fish and meat sale areas filled with the stench of rotting animals. Do you best to avoid these streets because the smell is almost overwhelming at certain times of the day. My sense of smell has improved considerably on a raw food diet, but this is one downside I can't ignore. One thing Muang Mai market lacks is organic greens. Although several vendors claim they don't use pesticides and fertilizers, I'm not sure if I trust them. I try to avoid conventional greens for quite a few reasons, but especially in Asia where many pesticides and fertilizers banned in the US are legal. Luckily, there are a number of health food stores and super markets that sell organic greens in Chiang Mai, so it's not a problem. Check out what the market looks like. Muang Mai Market can be reached on foot in a few minutes when leaving from the northeastern corner of the old city. One edge sits on the western shore of the Ping River, a bit north of the American consulate. Some portion of the market is running at just about any time, day or night. Most of the large-scale wholesalers open up at 2 or 3 a.m., with most of the smaller shops opening between 5 and 8 a.m. The market is generally winding down around 6 p.m.
You can get directions to the market using the google maps link below. Know of a fruit hot spot that trumps Muang Mai Market? Tell me about it. Find other fruit hot spots. Learn how to save money on fruit and then learn how to ripen it.